Explore behavior/contingency maps, a visual strategy that can assist with decreasing challenging behaviors. 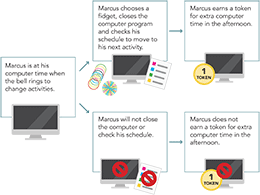 Behavior maps show an individual that a positive behavior choice can earn a desired item/person/activity while a challenging behavior choice may earn a consequence. Behavior maps can be effective because they illustrate in a concrete way the results of both the desired and undesired behavior. Social Behavior Mapping is a cognitive behavior strategy that teaches individuals about the specific relationship between behaviors, others' perspectives, others' actions (consequences) and the student's own emotions about those around him or her. SBM is a visual tool that displays these abstract concepts through a flow chart. Intended for 3rd-12th grade students, this strategy is most effective for students with solid language skills.